The Holy month of Ramadan has almost come to an end. This month has some amazing offers on everything including food. This post is about the well-known coffee shop Tim Hortons. Usually I go there for just a coffee and wouldn't blog about it. This time when I went there with a friend of mine, we saw some interesting Ramadan offers. A combo of Pesto Chicken (Sandwich + drink + chips/donut) would usually cost AED 35, but this time they had an offer that included the Sandwich + potato wedges + donut + drink (vimto) + dates for just AED 24 ! This was really amazing. I ordered the Chicken Cheese wrap combo for just AED 25 and this too had potato wedges and a donut apart from the wrap and the drink. The wrap was really good and so was the chicken pesto sandwich. The orange juice that I got with the drink was just about okay. The potato wedges were good too; and interestingly served really quickly. The dates were really juicy and soft. This is a fantastic restaurant nestled in one of the lanes in Karama. I hadn't quite heard about it before; it isn't all that popular among food bloggers for some reason. One day a friend and I was just thinking what to have and we thought of having Korean food. I searched online and this one popped up near us. I never knew there was an authentic Korean restaurant in Karama. Yes, it's authentic. As soon as we stepped in, it didn't feel like a restaurant at all. 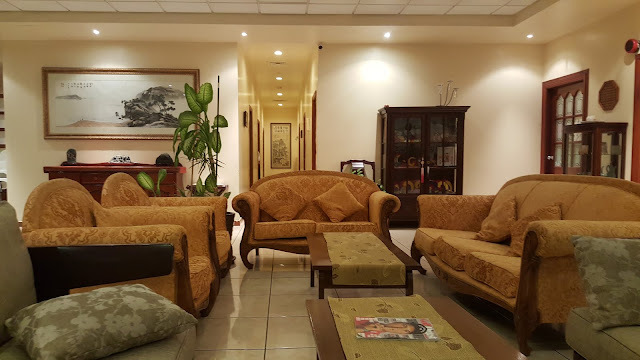 It felt somewhat like a lobby / waiting area of an hotel. We went to the counter and said we'd like a table for two. He told us to wait while he said he'll go and check which room is available. We waited. Wait, a "room"?! There was a room available and he showed us to one. There was a table and four chairs in there. Wow. This was something really interesting. Usually restaurants just have partitions / shacks, but this place has proper doors. 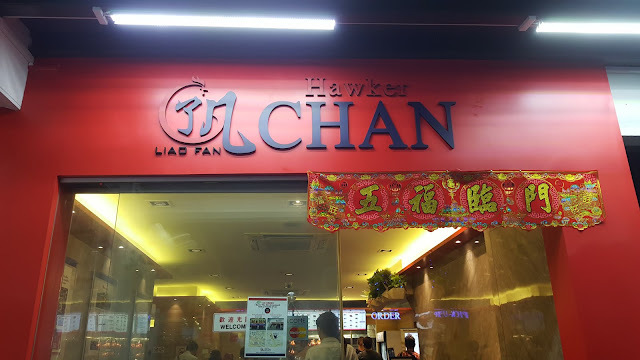 A friend and I were just going to another restaurant in the area, when this name caught our attention. There's much more than dosa to this place. It is a fusion Indian street food if I can say so. Also, they've tried to put in a lot of desi touch to it. The interiors are well-designed. They've got a small seating downstairs and some seating upstairs as well. 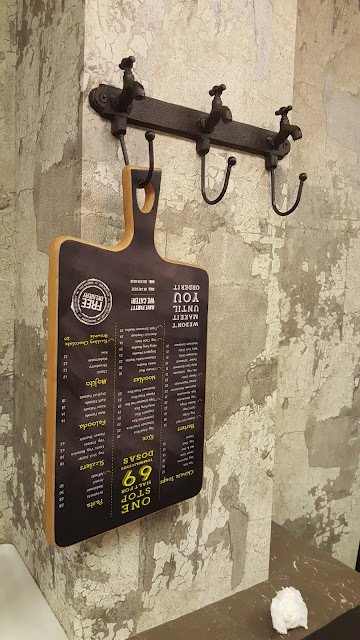 The menu cards look like a chopping board, and even the small hooks that they're hanged on, have an interesting design. I'm a fan of fusion food, and I like the creativity that people put in to make unique dishes. I saw "italian dosa" and immediately ordered one; but later I noticed that there are more interesting items such as "Zini dosa". It was something I hadn't heard of before. So we replaced the previous one with this instead. I was visiting Singapore, and while searching for Michelin starred restaurants, I came across this one which was the cheapest Michelin restaurant in the world. Their "Hong Kong Soya Sauce chicken Rice" which is awarded the Michelin rating is priced at just S$ 2 which is definitely the cheapest Michelin food in the world. The original one was a food stall in the Chinatown area; later, they also opened up a quick service restaurants about 5 minutes walk from the original place. I had gone there around 9pm but sadly it was closed already. The next day I went around 7pm, and that time it was open. There wasn't a long queue as opposed to what I read online. I ordered and paid at their kiosk and got the token number. They took about 5 minutes to get my order ready. There are a lot of people who come there to eat, so you may not always get your own table, and might have to share with someone. I refrain writing blogs of QSR (fast food restaurants) but this one deserves one. I saw about their burgers on Facebook and they looked extremely tempting. They've got burgers with patties stacked like the Burj Khalifa. Also, their patties aren't frozen; they make 'em fresh. 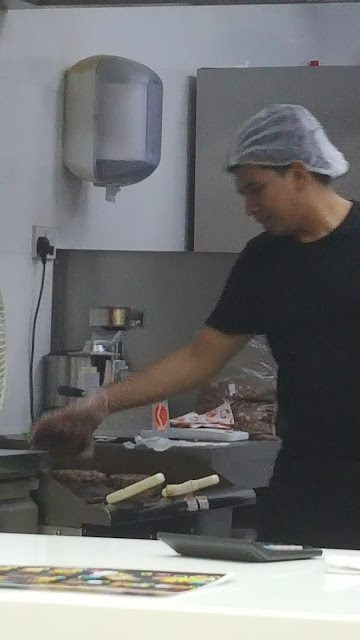 You can see it being made in the kitchen. The burgers are of different sizes and they're called "kilobite", "megabite", "gigabite" and the "terabite" based on the number of patties in it. All of these are with a beef patty. I wanted to order a "terabite" as it looked huge, but I wasn't sure if I could finish it. So my friend and I decided to share the "terabite" instead of ordering two small burgers. We made it a combo (fries and blue lemonade) by adding 6 bucks more. The lady at the counter was very courteous as opposed to most reviews here. Though they couldn't give a receipt that day as the machine wasn't working. When you want sushi, but aren't a fan of the traditional sushi, this is the place to head to. I know a lot of people including myself who don't really like sushi, so initially I was a bit apprehensive when a friend of mine took me there. Once there, I saw how different there sushis are compared to the traditional ones. These don't have the raw fish and rice. The sushis here have the shape of the sushi, but the ingredients are different and I actually ended up loving these. They have a huge variety: chicken, fish, mutton, vegetarian; as well as something unconventional like cheetos, hummus et al. 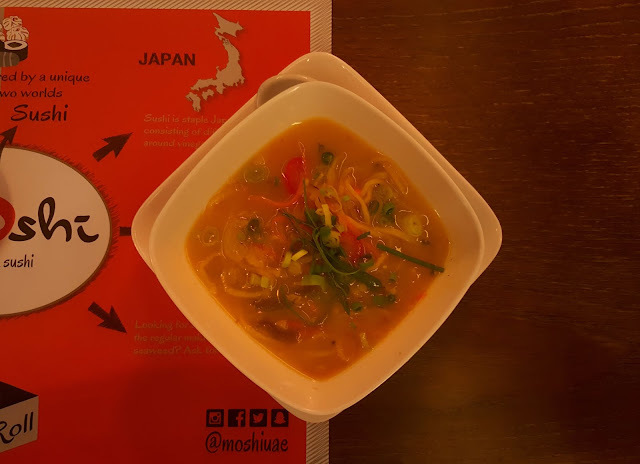 They've got some great soups and momos too. More on that ahead. To start with, we ordered a veg thukpa soup. It is a soup originated in Nepal and the surrounding areas. It has got noodles, spring onions, and a few other vegetables in various Nepali spices. The consistency of this soup is thick and it is really filling. The moment you step into this place you notice the rustic interiors. They're lovely. The inside seating is small and feels homely. They've got outside seating near the canal too. To start with, we ordered a fattoush and a moutabel. It was served soon along with fresh bread. The fattoush had a lot of greens, and on our request, they also put some feta in it. The moutabel wasn't bad either. We really liked it. After this, we were a bit confused as to what to order. 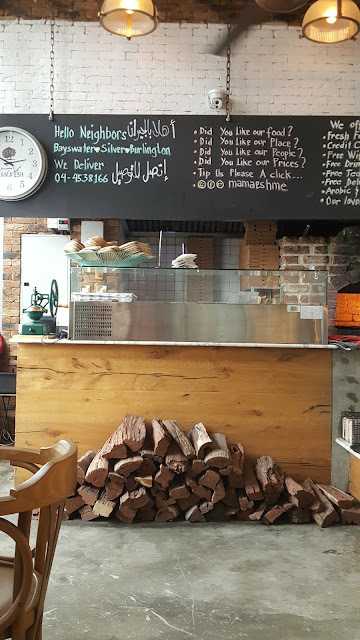 The friendly staff and zomato recommedations helped us in deciding and we finally settled on the Palestinian chicken musakhan roll. The name itself was unique, it made us order it. It is a chicken roll with a thin outer covering. It was a bit tangy, though fresh and extremely hot when served. We totally loved this one. I was looking for a place to go for breakfast with my parents who are vegetarian, and this place comes pretty close. Apart from egg, they don't serve anything that's not vegetarian. Finding this place was a tad bit difficult as the road dosn't lead right until there. Also, parking was in an open ground. So my initial impressions weren't that great. As we entered, we totally loved the ambiance. It is cozy, a bit rustic, small and earthy. 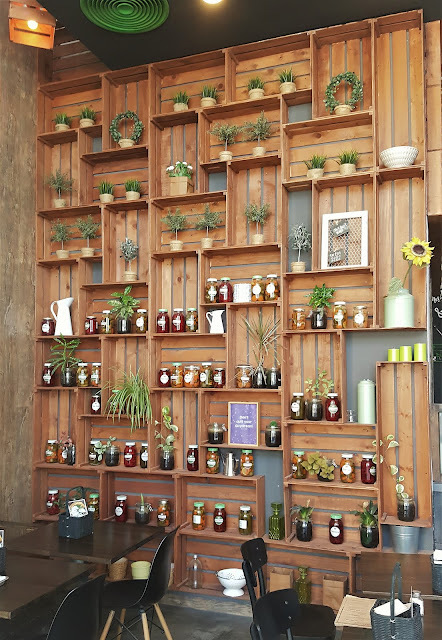 You see the spices & condiments and a few plants as you enter. We were the only ones at that hour here. We ordered a classic falafel pocket, a spicy falafel pocket, and a salad box.